It has finally gotten cold enough here to qualify in my mind as "winter". Just in time for Christmas. Heheh. So I have an excuse now, to get out all my pretty Christmas things. Today I'm having afternoon tea using some of my mom's china. 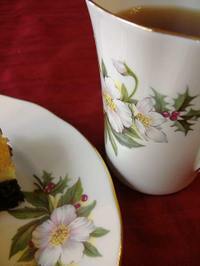 This pretty gold-rimmed cup and plate are adorned with holly leaves and berries, and what I think are winter roses. Very pretty. The holly reminds me of growing up. My grandparents had a ginormous holly tree growing right outside the back door, and every year we kids had the job of cutting sprigs to decorate the house with. Great, albeit prickly, fun. 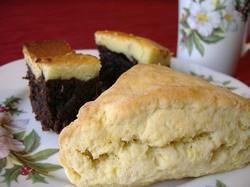 For goodies this afternoon I'm munching on a lemon scone (in a word -- YUM), and cream cheese brownies that are to die for. I really shouldn't be even LOOKING at these brownies, considering how much I ate for Thanksgiving, but it's my birthday, so what the hey. Heh. As if I needed an excuse to eat chocolate. Tea with those cakes and cookies? 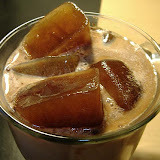 hmm.. yummy... :)Perfect! Tea is also good for reducing acid stomach. Its a natural alkaline and within seconds of drinking a strong cup such as English Breakfast tea, you'll be instantly cured. Try it ! Fill the pot with water and simmer to spread the flavors from the concentrate throughout the pot of tea. Serve warm. The Winter Gala tea was a favorite served direct form the wood stove. Wow..... its great. Love Costa Rica dark roast coffee flavour got at Cafe Britt. It tastes well. Excellent post!! !tat brownies looks delicious ...Thanks for sharing. Christine! A much belated Happy Birthday. It's been a long while since I visited MC&AT and I have much catching up to do! I hope you had a lovely holiday and wish you all the best for 2008! The china is lovely...and what's on it, too! I hope all is well with you. Those brownies look delicious! When can we look forward to the recipe? I have a teapot, creamer and sugar bowl and covered mugs in what I think is that same pattern. The roses are Christmas roses. My mom got them for me because my two daughters' names are Holley and Catherine Rose. Ummm, is there a way to lose that David dude? Otherwise, love this blog!! A nice cup of tea is great with pastries. I really want to see that recipe since it looks like something I'd be interested in making. I'd like to try that with some Coffee since I'm a big fan of both. Oh, drat, Christine! I got so snowed by "life as we know it" here in America's twc that I entirely MISSED dropping by with a timely "Happy B.D." No excuses. I guess I'll just have to make some lemon scones this weekend and eat them in your honor. Happy Birthday!!! The china (and treats) are gorgeous.